The MAXx Backboard System Package #1 includes the MAXx backboard, one of the most X-ray translucent backboards available. The MAXx backboard is made in the USA, is lightweight and has no metal pins. 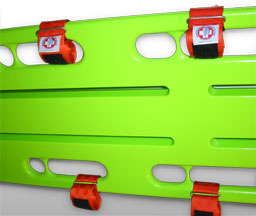 This backboard package includes 1 MAXx backboard, 1 laerdal SpeedBlocks Head Immobilizer and 4 Velcro body straps. The MaXx backboard is one of the most X-ray translucent backboard available. Dimensions: 72 x 16 x 2 1/4", weight of board 15 lbs. Backboard Package #1 MAXx Backboard system consists of: 1 MAXx Backboard, 1 Laerdal SpeedBlocks Head Immobilizer and 4 Velcro body straps.